West Orange, NJ – Essex County Executive Joseph N. DiVincenzo, Jr. announced on Wednesday, March 28th that the American Humane has granted certification to Essex County Turtle Back Zoo. AH is the third national organization to award certification or accreditation to the zoo, which exhibits Turtle Back’s commitment to providing the highest level of animal care. In addition, the County Executive announced that work was underway to build a new Flamingo Exhibit. “Receiving certification from American Humane couldn’t make me happier. We have invested a great deal to transform Turtle Back Zoo into a destination attraction and providing our animals with the highest quality of care is an integral part of our mission. Having the support of AH is further proof that we are committed to conservation, and raising the public’s awareness about animals and their important roles in our world,” DiVincenzo said. “Become a certified facility is not an easy task, and it was only made possible because of the dedication on a daily basis of our Zoo staff, volunteer Docents and Zoological Society members. I am proud that we have all come together with the singular goal of making Turtle Back the best it can be,” he noted. “Look at the beautiful facility we have here today. It’s because we have the support and vision of our County Executive, who cares about the zoo and our quality of life. 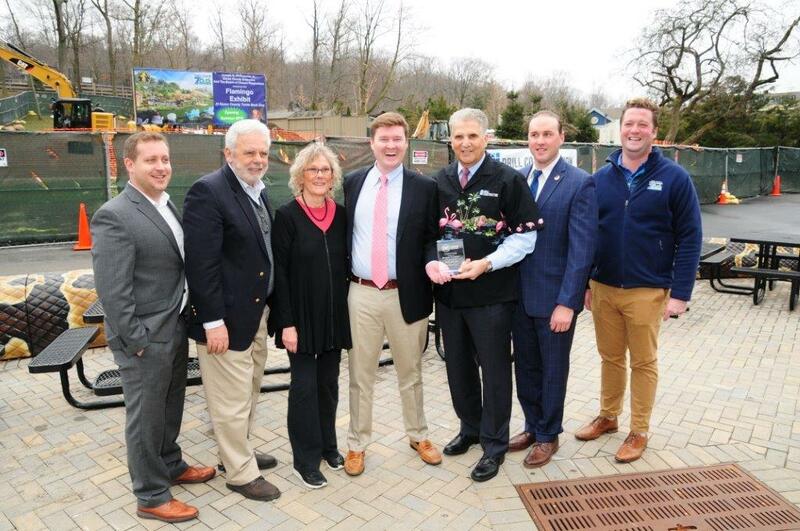 I want to thank everyone at the zoo for what you do and for making this a wonderful treasure,” Freeholder Patricia Sebold said. “The County Executive has followed the mast plan and made this a destination for everyone of all ages to enjoy,” Freeholder Len Luciano said. Turtle Back Zoo is the 17th facility in the United States to achieve certification through the global American Humane Conservation program for the welfare and humane treatment of the animals under its care. Turtle Back passed a rigorous third-party audit to earn the prestigious Humane Certified™ seal of approval. In addition to certification under the American Humane Conservation program, Turtle Back is accredited by the Association of Zoos and Aquariums and the Zoological Association of America, a clear indication that the institution is committed to the highest standards in animal care, ethics, conservation and education. The American Humane Conservation program is the first-ever certification program solely devoted to helping verify the humane treatment of animals living in zoos, aquariums, and conservation centers across the globe. The program enforces rigorous, evidence-based standards of comprehensive animal welfare, developed by an independent Scientific Advisory Committee comprised of world-renowned leaders in the fields of animal science, animal behavior, animal ethics, and conservation. Its extensive criteria exhaustively verify the many dimensions of animal welfare and well-being, with areas of evaluation including excellent health and housing; positive social interactions within groups of animals, as well as between animals and handlers; safe and stimulating environments, with concern for factors such as appropriate lighting, sound levels, air quality, and thermoregulation; and evidence of thorough preparation and protocols established to prevent and manage medical or operational emergencies. “Getting certified by one organization is hard, but earning and maintaining certification from three groups is very difficult. However, it displays our commitment to providing first-class and humane conditions for that animals that are in our care,” Turtle Back Zoo Director Michael Kerr said. “I thank County Executive DiVincenzo for giving us the resources to make Turtle Back a first-class facility and our staff for banding together every day to fulfill our core mission of conservation,” he added. “This recognition by American Humane is a fantastic thing for Turtle Back Zoo. It shows our commitment to animals,” said Adam Kerins, Executive Director of the Zoological Society of New Jersey. Founded in 1877, American Humane is committed to ensuring the safety, welfare and well-being of animals, and strengthening the bond between animals and people. Its innovative leadership initiatives – including the “No Animals Were Harmed®” program in Hollywood to broad-based farm and conservation animal welfare certifications, to rapid response rescue and care across the country – help American Humane set the gold standard as the most visionary and effective animal welfare organization in the nation. DiVincenzo also announced plans to build a new Flamingo Exhibit, which will be located in front of the Savanna Café. The old Penguin Coast Exhibit formerly located at the site was demolished and removed to make room for the flamingos. The penguins will be relocated to the new African Penguin Exhibit currently under construction in the African Adventure area of the zoo. “When we decided to relocate our penguins to the African Adventure section, we wanted to replace the exhibit with an animal that could captivate the attention of our visitors. This was especially important because the area is across the pathway from the Savanna Café and those eating on the second floor deck will be able to look into the exhibit space,” DiVincenzo said. “With their unique appearance and colorful feathers, the flamingos are sure to become a favorite of our visitors,” he added. Flamingos are found around the world from the Caribbean and South America to Africa, the Middle East and Europe. They are famous for their bright pink feathers, stilt-like legs and S-shaped neck. Their favorite foods include shrimp, snails, and plantlike water organisms called algae. An average flamingo can weigh about 8 pounds and be about 40 inches tall. The new exhibit will feature a pool, nesting island in the middle of the pool and an imitation waterfall. There will be a 1,000-square-foot indoor facility to hold the flamingos when they are not on exhibit. Shade structures will be provided in the viewing areas for visitors. “Flamingos are a good addition to Turtle Back because we don’t have many exhibits featuring birds and this will help diversify our animal family,” Kerr said. “Our mission at Turtle Back includes promoting education about and understanding of animals. Because flamingos are found in many parts of the world, we will be able to highlight conservation efforts and cultures from different parts of the globe,” he added. French and Parrello from Wall, N.J., designed the Flamingo Exhibit as part of an existing contract. Drill Construction from West Orange was awarded a publicly bid contract for $3,201,810. Funding is being provided with grants from the Essex County Recreation and Open Space Trust Fund and NJ Green Acres program, and an allocation from the Essex County Capital Budget. It is scheduled to be completed by the summer of 2018. Essex County Turtle Back Zoo has roared back to life from the verge of closure by a previous administration. Attendance reached an all-time high of 907,522 in 2017 and the zoo has operated as a self-sustaining facility with revenue collected exceeding operating expenses for the last 10 years. Turtle Back Zoo is open seven days a week from 10 a.m. to 3:30 p.m. Admission is $10 for children and senior citizens, $12 for adults and free for children under 2 years. For more information, call 973-731-5800 or visit www.essexcountynj.org/turtlebackzoo. Also currently under construction is the African Penguin Exhibit and, since taking office in 2003, DiVincenzo has spearheaded over $75 million in upgrades to Essex County Turtle Back Zoo, which have included developing the African Adventure with four Masai giraffes, lions and hyenas; a new Educational Building; the Carousel with 33 figures of endangered animals; the Sea Lion Sound Exhibit with sea lions, sharks and sting rays; the Big Cat Country Exhibit with jaguars and cougars; Tam-ring Gibbons Reserve with white cheeked gibbons apes, Reeves muntjac and white-naped cranes; Australian Exhibit that features kangaroos, wallabies, emus and over 500 birds in the Aviary; Reptile and Education Center, open air dining pavilion and playground, Penguin Exhibit, Otter Exhibit, Wolf Exhibit, Alligator Exhibit, North American Animal Exhibit, Black Bear Exhibit, Animal Hospital, Essex Farm Petting Zoo and South American Animal Exhibit; renovating the Food Pavilion for year-round use and making upgrades to the entrance as well as fencing and infrastructure to meet AZA requirements. Funding has been provided through Green Acres grants, existing capital improvement bonds, or donations from the Zoological Society, Essex County Parks Foundation, corporations or private foundations. Corporations that have provided support include Investors Bank, Prudential Financial, Inc., Wells Fargo, PNC Bank, PSE&G, Verizon, Horizon Blue Cross Blue Shield of New Jersey, Coca Cola, Capital One Bank, TD Bank, Aramark, Covanta Energy, Matrix Development Group, the family of Ronald Mount and OxyMagic carpet cleaning.